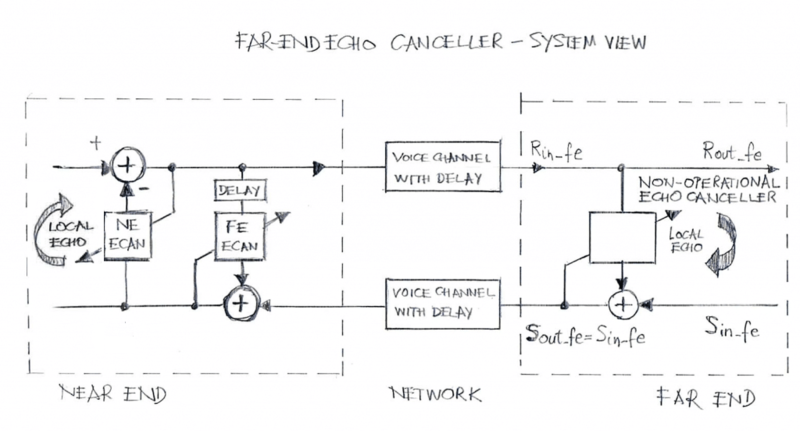 In a voice communication link, a far-end echo canceller is designed to operate at the near-end location to cancel echoes in the signal received from the far-end. 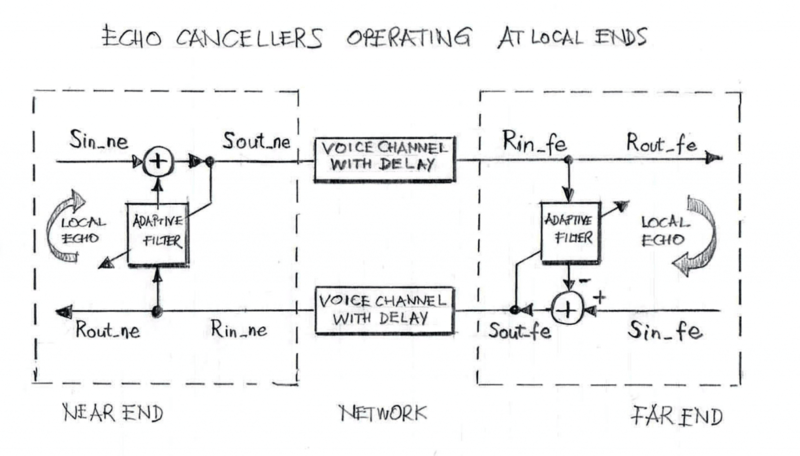 Line/Network Echo Cancellers are typically designed to cancel echo signals occurring at the near-end for the voice connection and effects of the echo cancellation are observed at the far end. In other words, operation of cancelling echo at the near end benefits the end-user, and vice versa (cf. Figure 2). Often both ends of the voice connection are serviced by separate administrations. In the case where a customer complains regarding the presence of echo or inadequate cancellation of echo, say, at the near end, it is hard to address such complaints without technical support by the administrator or service provider operating at the far end. To facilitate operations of cancelling echoes occurring at the far end by echo cancellers under control/jurisdiction of the local telecommunication service provider, far-end echo cancellers were developed. The system view (Figure 1) depicting coexistence of the near-end and far-end echo cancellers, in the case where the local echo canceller intended to operate at the far-end either is not operating properly, simply is turned off or not present at all. Both echo cancellers operating at the near end for the benefits of end users (subscribers) can be combined into one functional block, a dual-echo canceller, as shown in Figure 3. 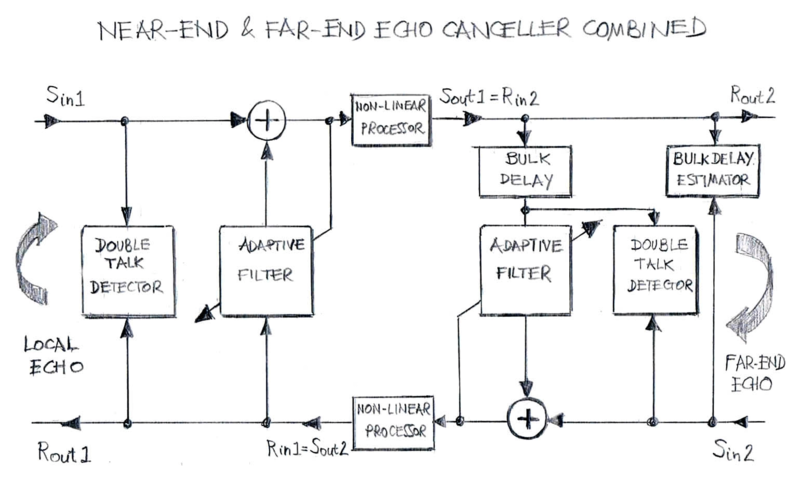 Conceptually, the Far-End Echo Canceller is a version of Line Echo Canceller with Bulk Delay Compensation that allows for large delay compensation , sometime reaching approximately 500 ms (round trip delay) or more. For example, in the case of communications satellites located in Geostationary Orbit (GSO) at altitude of 35,786 km above the equator, the shortest round trip delay (i.e., the duration the echo signal travels from the near end to the satellite to the far end, then reflects from the far end and travels over the same route) is approximately 480 ms. Because of the large signal delays observed within the far-end echo canceller, some sub-systems of the echo canceller have to redesigned and tuned in order to properly operate. For example, the double-talk detector has to have information about the delay between Rout and Sin (as a predefined parameter, known a priori, or through adaptive estimation of that parameter) in order to properly control adaptation of the adaptive filter. VOCAL’s Far-End Echo Canceller design has been simulated using test vectors representing use cases corresponding to far-end reflections both in single-talk scenarios as well as in double-talk scenarios. The supported round trip delays are up to 640 ms (configurable) of which 128 ms of echo path delay covers the dispersive part. VOCAL’s Far-End Echo Canceller can be ported onto any of the typical DSP processors and then made available for customer evaluation in their network environment. Please contact us to discuss your echo canceller application requirements.